Designer, maker, ceramicist. Sue Pryke is quite literally spinning the plates and rightly defying categorisation. 1 - Has ceramics or pottery always been your thing? I never had an ambition to work with clay or to design. I was always good at art, loved English and Sports at school but was more likely to become a florist and open a shop with my mum, as this was associated with the family business in Lincolnshire, where everybody was connected to growing flowers or crops. At A level I randomly opted to do ceramics as part of an Art & Design A level and had a really inspirational tutor who got me interested in clay and taught me to throw and hand-build. 2 - Where too next on the design journey? I started as a potter, helping a local potter in rural Lincolnshire to wedge clay and prepare clay for throwing. I chose to do a Three Dimensional Design degree, Design For Manufacture and began working at Wedgwood as a designer. I went on to do an MA at the Royal College of Art. After graduating I set up a studio in London and made my own work, selling to The Conran Shop, Heals, Liberty, etc and working as a freelance designer. I found that I couldn’t keep up with production, friends used to come and help slipcast just so I could keep ahead. So I sourced a couple of UK factories to make ware for me and I concentrated on just design work for companies like IKEA, M&S and a variety of factories. 3 - Ceramicist? Potter? Designer? How would you define yourself? I don’t neatly fit into any category. I think after a few stints working in-house as a designer for homeware companies, years as a freelancer and a couple of decades on Ikea’s books, that I’m probably a designer. I think of myself as a designer. Certainly not a potter. But on the other hand I’ve always kept my hand in with making. So I bridge that gap between craft and industry, happily moving in both realms. 4 - Where do you live and work? I live in a village in south Leicestershire and have a work shop at home. I came to Leicestershire to run the Ceramics course at De Montfort University at the same time as expecting my first child, my husband is from Leicester too, so it seemed the most obvious choice to move from London. 5 - Dawn till dusk…what does your day look like? I have 3 children, so the mornings are family focussed to get them up and out for the day. My eldest is an elite swimmer so we have to get her to training for 5am 5 times a week. The early starts are great, as I can drop her at the pool and come back and get a couple of hours of work in, go for a run or walk the dog early before everyone’s awake. 6 - How do you work…what are working habits? rituals? needs? Work wise everyday is different. It’s really great just to be in the workshop and be slip-casting all day or model making listening to the radio; you tend to zone out and be in a world of your own with absorbing tasks like these. When I look back at certain pieces of work, I can remember what radio programme I was listening at the time, especially if you get engrossed in a story or play. I’d quite happily slipcast all day everyday, or be at the computer designing, or be turning a new shape at the lathe; ideally I need a team of assistants to do all the other bits that break the continuity of creating. 7 - What motivates you and excites you to make new work? 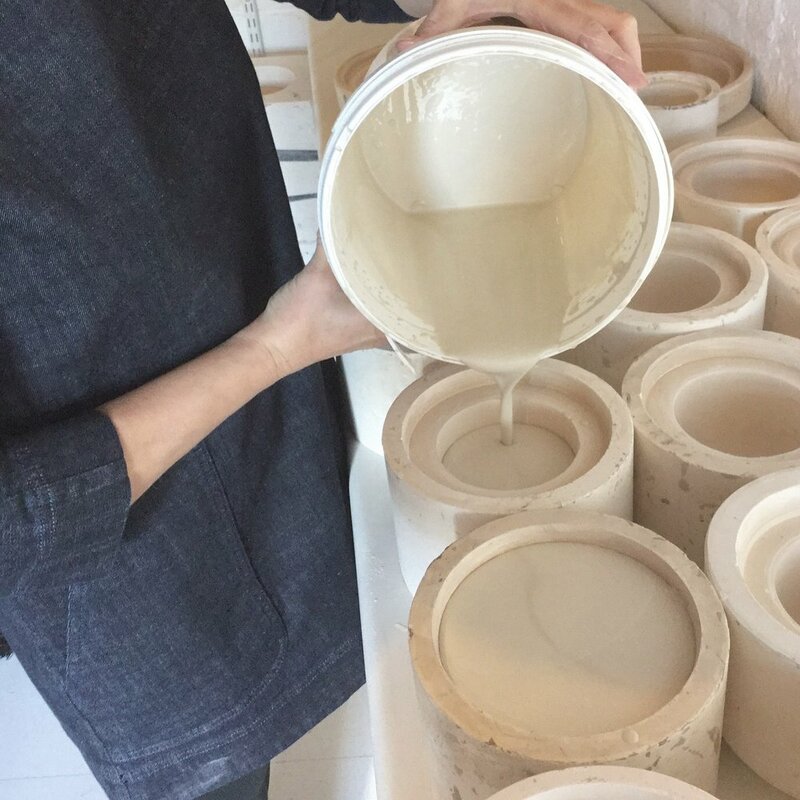 The need to make tableware, to create a landscape for the table. It’s not really designing sets as such, I like the balance of different materials, surfaces and colours, I’m pragmatic too – probably from my farming background – which means I like things to work & function. I’m primarily a shape designer, my background is firmly rooted in the crafts, my first job was with a potter who dug and processed his own clay and made everything from scratch and thought slipcasting was cheating! I've since worked for some of the world’s biggest volume producers firstly as a junior designer and latterly as a design consultant naturally this informs my practice. I’m fascinated by processes, how craft meets industrial design and where you can go with that, maybe a suggestion or a tweak on a traditional shape or way of working that shifts an idea into a contemporary field. 8 - Where do you draw your inspiration from? Landscape, big open spaces. Space to think and clear the head. Wild windy, walks... doesn’t have to be windy, but I do like a bit of weather, fog and frost is a great combination! Sometimes historical referencing, such as the V&A, Wedgwood archive material. And a trip to a factory is always a pleasure. 9 - What is your end-of-the-rainbow project? I love collaborating & I’ve really enjoyed working in teams, it’s exciting to develop products from initial trend research through to launch of a full collection. So more work like this would tick a lot of boxes. 10 - What is your most treasured possession? I can't live without my hands & my sight.